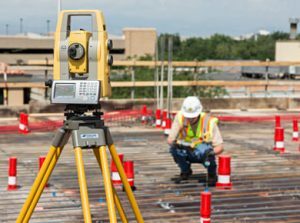 The survey positioning part of the equation breaks down into, 3D GPS, 3D total station or 2D laser and this, is what is used to ‘guide’ the machine. 3D refers to a complex 3-dimensional model whereas 2D is a more basic level of grade. How does machine control work? For 3D GPS systems, GPS receivers are mounted on the machine which in conjunction with a GPS base station tells the system its position accurately. The 3D model is loaded onto the system so the machine knows where it needs to be to achieve the required design. The system combines these 2 sets of data so the operator can dig the difference. A 3D total station system works exactly the same as above. Except the GPS receivers and base station are replaced with a prism and a total station. For 2D systems, laser receivers are mounted on the machine and use the laser beam from an external rotating laser to indicate where the required level or grade is. 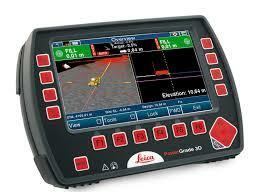 The most common brands available from the three big survey equipment manufacturers are, Leica, Topcon & Trimble. With each manufacturer providing a full range of Machine Control Solutions. Although each manufacturer provides solutions in different ways, each system will include the same basic components for each type of machine. 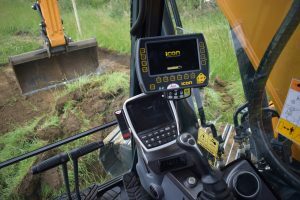 For a typical 3D GPS dozer installation, there will be a cab mounted control box screen that provides the operator with real-time grade information and control as well as being the interface for loading data files. There will be a controller mounted elsewhere in/on the machine that processes the GPS & radio data. Then there will be 1 or 2 GPS receivers mounted externally, usually on the blade or counterweight that picks up the satellite signals. 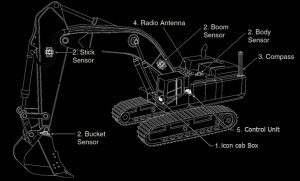 An excavator will have the same components as a dozer but will also have tilt sensors mounted on the body, boom, stick & dog bone which are used to calculate the position of the tip. 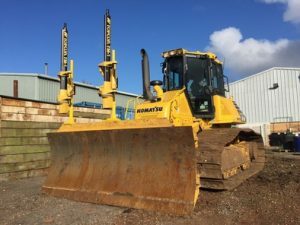 A 2D system is a simpler system, usually on a dozer and consists of 1 or 2 laser receivers mounted on masts behind the blade with a simple screen mounted in the cab to relay the grade information. One last key component, which many people still overlook, is the actual survey equipment itself! This will usually either be a GPS base station, Robotic total station, or Dual grade laser. Which brands are the easiest to use? 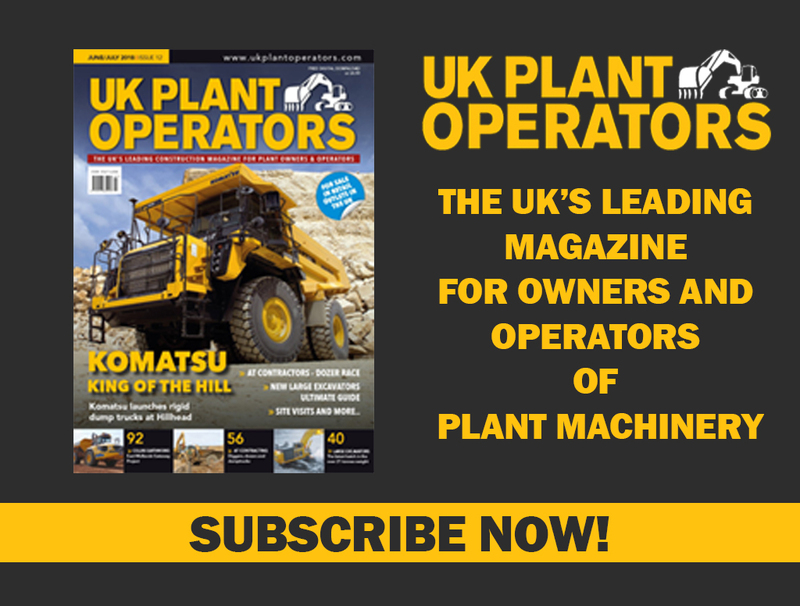 Similar to the surveying equipment market – machine control equipment is very much user or site preference, operators tend to feel most comfortable with the system they have learned or have spent time using. We must remember that although the hardware and software may look different – we have the apple/android situation. All of these systems are working to the same levels etc. on the model provided for the site although; each manufacturer provides added features on their systems which may provide an extra benefit to the customer. What is usually expected from the operators? Once a system is correctly set up with good 3D data and engineering, the operators job will be easier as they can just follow the on-screen guidelines as to what to trim or dig. There is no need to rely on external guides such as string lines, batters or an engineer with a staff. Basically once set up correctly this should perform in the same way that a car Sat Nav would. Obviously not all sites are set up perfectly and the system is quite complex so if, an operator has a good working knowledge of the limitations of the components or of common faults, then if there are any issues they can be resolved quickly rather than having the machine stood down. What is usually expected from the engineers on site? 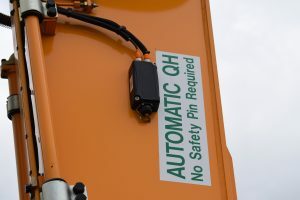 One of the most common misconceptions with Machine Control is that people believe that it will do the Engineering works for them automatically and therefore they can save money on employing an Engineer. The Engineer will still need to complete the usual site set up works but rather than spending time going around site banging pegs in the ground and putting up batters to guide the operator they can rely on the system to guide the Operator and concentrate on more productive tasks. 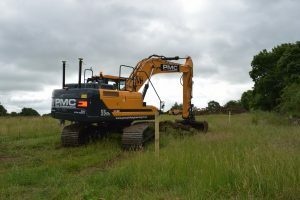 Simply put from an Engineers point of view the machine becomes the rover so rather than walking around site marking out the design the machine can track around levelling, grading or digging to the design automatically. This then allows the engineer to carry out “dip checks” to check the accuracy of the work against the design. Where can an operator get advice on using the system? At Opti-cal (A specialist division of A-Plant) we carry out driver training programs once installation is complete. We go completely through the system and answer any questions whilst on site. With the addition of Machine Control technology being added to machine simulators, operators are now able to attend machine control training if they so require. Where can they hire or buy the systems from?